Tightwad Hill: WHITHER TIGHTWAD HILL? As this article indicates, the long-anticipated renovation of Memorial Stadium has hit a small but very vocal snag. According to a noisy handful of fans, the current plans threaten to compromise all or part of the picturesque free view they currently enjoy from Tightwad Hill. The group plans to deliver a petition with more than 1,000 signatures to UC regents at their upcoming meeting, which will earn them a cookie and warm cup of STFU. While this controversy is unlikely to delay re-construction of Memorial in any way, it raises some interesting issues that are at the core of Cal's evolution from lovable loser to aspiring national power. First, a primer for those visitors who may be unfamiliar with one of the oddest traditions in college football. When Memorial Stadium was built in the early 1920s, construction teams had to blast and reshape the hills of Strawberry Canyon to accommodate the new structure. Their work on the northeast side of the area resulted in a large relatively flat area of about 500 square feet that looked directly into the bowl of the stadium and beyond it, to the City of Berkeley and the San Francisco Bay. History does not record whether the University considered the possibility that intrepid freeloaders could climb on to this hill and watch games without buying a ticket. Perhaps they were too consumed by the majesty of their creation, which in its day was a true technical and aesthetic marvel. Whatever the case, students and Berkeley residents quickly seized upon this property, which was dubbed "Tight Wad Hill." 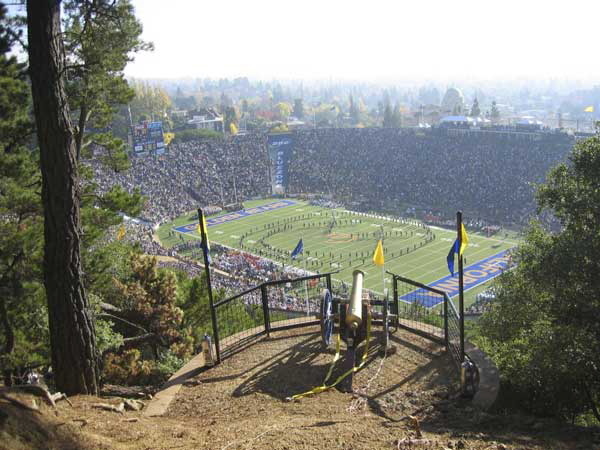 Tightwad Hill has remained a popular option for fans who either cannot or - in most cases - will not obtain a conventional ticket to watch the Golden Bears. Attendance swells when Cal fills its stadium, most often against the LA schools and Stanford. In 1924, thousands of fans jammed the Hill and watched Cal and Stanford battle to a 20-20 tie in a game the great Walter Camp said was "one of the most exciting (he had) seen on any coast." In 1972, when Pac-8 officials banned the presence of cannons or other 'explosive devices' in conference stadiums, Cal students simply dragged the cannon up to Tightwad, where it has celebrated Cal scores ever since. 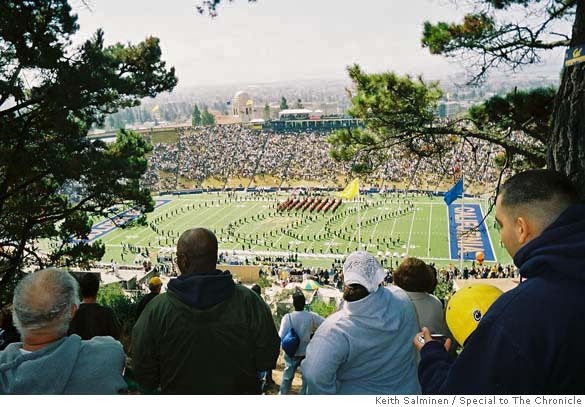 Nowadays the numbers are a bit more manageable (a few hundred for most games), and Tightwad Hill has become one of a handful of enduring traditions in Cal football. It also fits in nicely with Cal's counter-culture heritage - the Tightwad loyalists love the fact that they can watch the Bears and stick it to the man at the same time. Which brings us back to the issues raised by the stadium renovation. Cal has needed to renovate Memorial for many years - for starters, it sits on the Hayward Fault and lacks necessary seismic retrofitting. It also lacks appropriate seating and first-world bathroom facilities. But despite the evident need, plans did not kick into high gear until Jeff Tedford arrived on campus. Without Cal's recent success, and Tedford's own insistence that improvements be made, it's doubtful that University would have made this project a high priority and taken on the Luddites in the Berkeley City Kouncil. From what I understand, the view from Tightwad would be compromised by the proposed installation of a new seating structure and permanent lighting above the student section on the east side of the field. Why do we need to add seats and install permanent lights? Because we're winning, and because we want to move Heaven and Earth to retain the Coach who is asking for these and other improvements. I've talked to some who have made the faulty comparison between Tightwad Hill and other iconic vistas in CFB like Touchdown Jesus on the Notre Dame campus. They posit that Notre Dame would never obscure the view of Touchdown Jesus for the sake of more seating. Of course they wouldn't. They're Notre Dame, and they own their own television network. Mere mortal universities have to keep up with the Joneses, and for Cal that means creating a set of physical legacies that will endure long after Jeff Tedford has left Berkeley. That said, the University and City should do whatever they can to "design around" Tightwad Hill. The Hill is an important part of the history of the university, not just the football team, and it's a tradition worthy of respect. 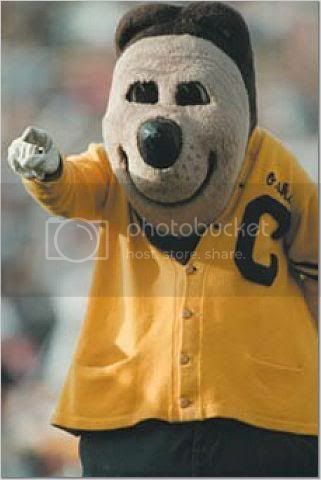 Look, I revel in the fact that Cal is now a winning program. But I love my alma mater much more than I love this football team. Berkeley is a quirky, chaotic and unpredictable place. It's the one place in America where current and future members of The Establishment can feel like they're thumbing their noses at, well, themselves just by walking under Sather Gate. It's a school where football fans cheer as loudly for Nobel laureates as they do for DeSean Jackson. It's the only university that could have produced the inspired anarchy of The Play. In the end, Dan Sicular and his merry band of protestors will likely get half a loaf - they'll have a hearing with the University brass, and Memorial 2 will only obscure part of their panoramic view. That's what folks outside of the People's Republic call a compromise, and it makes perfect sense here. Hi, I saw your post in the process of researching mine. Who actually owns the land; the University or the city of Berkeley? Tightwad Hill was constructed so that overflow crowds could safely watch the games. Look at the old photos, it's like Greek theater seating! What people have forgotton is that the Game was formerly played in San Francisco. During the 1899 Big Game, a horrible catastrophe occurred. A rooftop next the the playing field was overcrowded with hundreds of spectators, mostly boys and young men. During the game, this roof collaped, sending at least 13 boys and young men to death in bubbling vats of moulton glass below! Many, many more were severely injured. A similar rooftop collapse happened during the Game only three years before. Accomodating overflow crowds was part of the design. The man who built the Stadium, Robert Gordon Sproul, lived a few blocks away from this tragic event. He was 9 years old and likely knew some of the dead. The Stadium was built with $100 contributions from people all around California, especially San Francisco. These $100 contributions were largely collected while the stadium was intended for construction in downtown Berkeley, near transit lines and other athletic facilities. The Stadium's eventual isolation on the hillside was an expression of dignity and a means to avoid buying property in downtown Berkeley. It should also be noted that while he built Memorial Stadium (as THE CALIFORNIA WAR MEMORIAL), Robert Gordon Sproul was also the Treasurer of an organization called, "Save the Redwoods." The University's plan to build the adjoining building before assessing whether the Stadium can be upgraded is backwards and unsafe. It completely contradicts the primary goal of the design, insuring the spectator's safety.